I keep hoping that we'll get some art updates for some of the older colors. There are graveyard pets like the Swampie that haven't had their art touched up in several cycles. That being said, one day I will have a blob army. I just need like. 20 more pet slots. Still hoping for a chibi scootle. It's a little living ice cube! 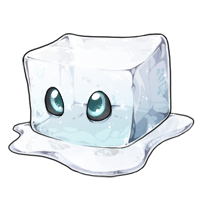 Better keep him in the freezer, can't have the little guy melting on me like he's melted my heart. This might have to be my 20th pet. How exciting! YAAAAAAAY! FINALLY MORE BLOB! MORE SCOOTLES AND BLOB COLORS!!!!! ESPECIALLY GLADE!! I imagine Graveyard referencing Viorans who are born with double defective X chromosomes. I don't think I could suggest that, right? The art style is absolutely adorable. Thank you for yet another lovable Blob! I want to know the secret to everlasting ice cubes.... TELL ME!!!! Very cute, and kudos to the artist. It does remind me of Fox's Glacier Mints! "You've successfully morphed Xaiden into a Blob!" Girl, you gotta check my profile. I made a prediction drawing of this blob last year! I was expecting a snowflake or an iceberg. I was prepared to resist. This... this I cannot. WANT. NOW. I really didn't expect to like the blobs as much as I have so far. I already have two for the sake of .hack//INFECTION references and 21/21 pet slots filled, plus I've been eagerly awaiting the eventual arrival of the Storm Legeica, on top of being super broke in real life right now.... I don't think I can really fit another pet for a while, but I'll definitely do what I can! I KNEW IT!!!!!!! I knew it would look like a melting ice cube!!!!! minion that one looks sad and petulant that it's melting. Me, I'm worried about how it eats. Do you put snowcones on top of it and hope it osmose-es, or does it have a (mysteriously hidden because we can see through it) icicly-fanged maw worthy of any abominable snowman? Oooh, I think Booza will be this soon ! I looove it. If the image isn't showing, just click on my username and you'll see it on my profile. I read that as "Glacier BOB" and thought "Oh cool, new character." I WAS RIGHT! I WAS RIGHT! THE GLACIER BLOB IS AN ICE CUBE! Very cool. Too bad it doesn't have any icicles around it, that would be great. Reminds me of a block of tofu... if tofu was kind of blue. I need one of these inside my head so that I can learn how to chill. I need itttttt. So cute!! You've successfully morphed Icier into a Blob! It;s so cute!! I love it!! I love it so much!!! Long live the blob!! !